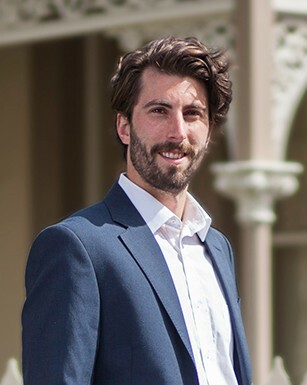 Aaron Richards - D&C | Domain & Co.
As Partner and Department Head of our Property Management Department, our team and clients lean on Aaron for his unwavering stability, expert advice and respected guidance. With a reassuring manner, Aaron is brilliant at finding solutions for clients and prides himself on his holistic and proactive (rather than reactive) approach to property and team management. With this progressive approach, Aaron champions his client’s investment properties, and is a steady and calming influence in the office. BEST PROFESSIONAL ADVICE Difficult decisions are all around us, but most people create more stress in their minds than they need to when it comes to making decisions. Making a decision is better than not making a decision at all – don’t over think it. WHAT I LOVE ABOUT PROPERTY Everyone has a unique relationship with property; tenants and investors from every socio-economic demographic all have a different type of connection with real estate. Being able to work with all different walks of life, and learn to read their varying needs, is what I love. MOTTO I LIVE BY Expect the unexpected. I like to live my life with this in mind as a reminder to be adaptable and resilient, which is particularly important in our line of work.